Glacier National Park, located in the northwest corner of Montana, is one of the most photogenic places I’ve ever been. I have photographed landscapes all over the world as a professional photographer, and I always joke that, in Glacier, no matter what camera you’re using or what direction you point it, you’ll get a photo that will wow your friends! With that said, there are a few iconic locations that always keep me coming back for more. Lake McDonald – Most people’s first impression of Glacier starts with Lake McDonald on the drive in. I’ve watched hundreds of sunrises and sunsets in this location, and they never get old. The colored rocks in the water and silhouette of the peaks are unmistakable. Hidden Lake Overlook – One of the most popular hikes in the park, and for good reason, is Hidden Lake. It starts at the top of Logan pass and passes through the Hanging Gardens meadow where you’ll often spot mountain goats and wildflowers. At only 2.7 miles roundtrip, the Hidden Lake hike is a great one to get the legs warmed up for bigger Glacier hikes! Going to the Sun Road – Often considered one of the top drives in the world, Going to the Sun Road winds up and over the glacially-carved mountains that give Glacier National Park its namesake. The views from the side of the road are spectacular and sunsets leave your soul feeling satisfied. 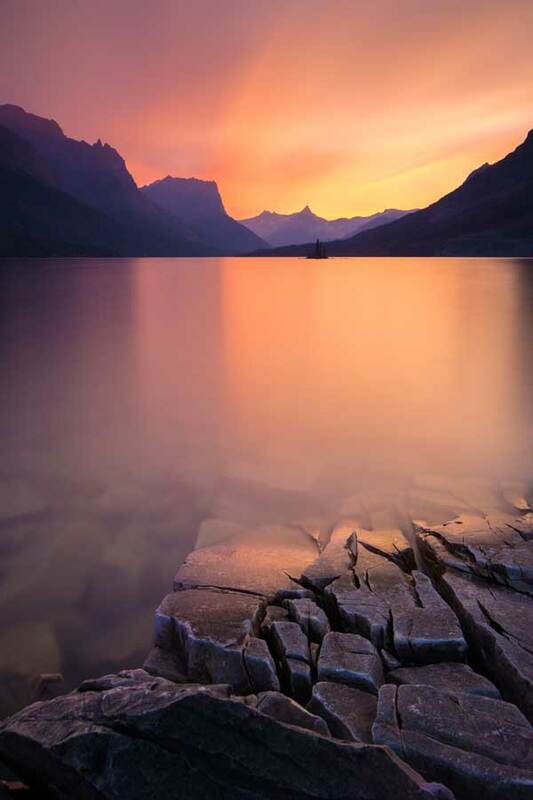 Swiftcurrent Lake – On the east side of Glacier National Park is a short road that leads you into the ‘Many Glacier’ area of the park, and sunrises over here are to die for. Start with an easy one and by watching the sunrise from the porch of Many Glacier Hotel looking out over Swiftcurrent Lake. 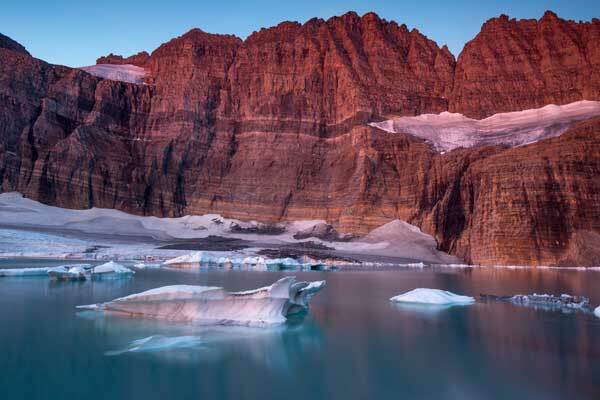 Grinnell Glacier – Don’t leave the Many Glacier area of the park without taking in one of the most stunning hikes in the park. There’s a boat shuttle that takes you across Swiftcurrent Lake and Lake Josephine that shaves 3.4 miles off the hike, bringing the total round-trip mileage to 7.6 miles. Upon getting to the glacier, take in the views of one of the last remaining glaciers in Glacier National Park, and if you’re brave enough, take the polar plunge whilst surrounded by icebergs! Iceberg Lake – Considered one of the more strenuous of the popular hikes, Iceberg Lake is well worth the journey. Clocking in at 9.7 miles roundtrip and an elevation gain of 1,275 ft, it will get those legs working. You’ll finally burn off all that huckleberry pie you’ve indulged in. St. Mary Lake – You might remember this view as the opening scene to ‘The Shining’, but it’s also one of the most beautiful views in the park. Sunrise to sunset, there really is no going wrong at St. Mary. Avalanche Gorge – Besides Hidden Lake, the trail to Avalanche Lake is one of the most popular hikes in the park. 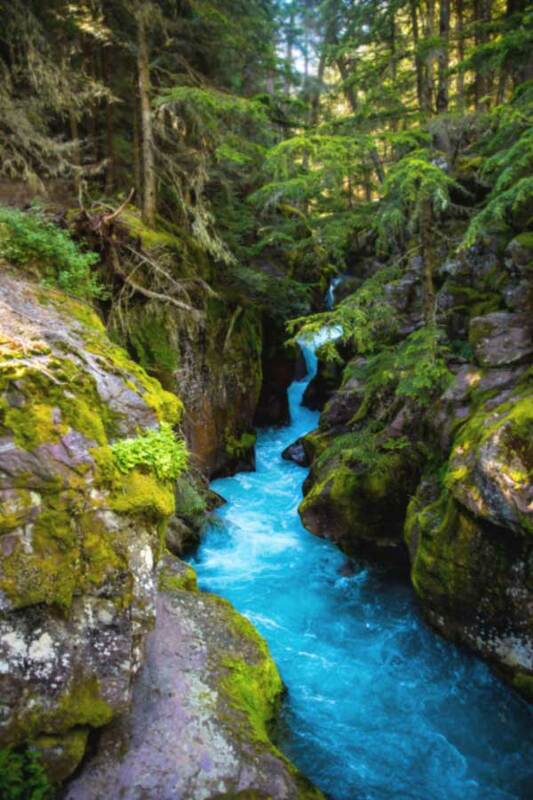 Don’t expect to have this trail to yourself, but you’ll forget all about the people once you see that crystal blue water flowing through its lush green gorge. The trail to the lake goes through the eastern-most cedar forest in the United States, with red cedars growing upwards of 100 feet tall and seven feet in diameter. Two Medicine Lake – The Two Medicine area of the park is an unmistakable sight with colorful rocks similar to Lake McDonald, and towering glacially-carved valleys and mountains in every direction. Bowman Lake – Last, but definitely not least, on this list is Bowman Lake. Bowman is another lake that you can drive to, but the road conditions can be a little bit rough. The long dirt road deters many from visiting, but the reward at the end is more than worth it. Pro tip – make time to stop at the Polebridge Mercantile for a Huckleberry Bearclaw!